As the saying goes – A home is where your feet may leave, but not your heart. Your home is where you spend most of your time, with your guards down and spirits up. That said, it is no surprise that the interior design style you incorporate in your home is a reflection of your personality and way of life. Here are a few interior design styles and their respective personality traits to transform your house into a nurturing home. Personality trait: Outgoing and practical with a quest for culture and heritage. Scandinavian interior décor is what you get when functionality meets minimalism. Characterised by immaculate white walls, this quaint home décor style screams sophistication and modernism with a twist of heritage and history, just like its friendly and culturally-inclined host. The key colour scheme used here is anything between brown earthy tones and lush green hues elevated with a vivacious white backdrop. The plain walls give you the liberty to play with textures and patterns in your home accessories, whether it is a curtain with a vibrant print or brightly-coloured candlesticks. Personality trait: Nature-lover and outdoor enthusiast with a zeal to experiment. Bring the outdoors in with an old-world charm that instantly upgrades a small space to a smart one. As the name suggests, farmhouse décor translates to raw and unfinished textures in rustic materials like wood, stone, and leather. Unlike the simple Scandinavian design, this home décor style resonates drama and substance with furniture that makes a style statement. Think plush sofas, furry rugs, and weathered brick walls, brought together with a majestic fireplace. The vibe given out by the rustic farmhouse home décor style is larger than life, just like the homeowner who loves to add a modern twist to conventional designs. Personality trait: Travel enthusiast with an intense love for sun, surf, and sand. Coastal interior design is one of the biggest décor trends where your love for the beach cannot be breached. Design your space with accents of the ocean and experiment with fresh hues of blue, sea green, pastel browns and dirty whites. Opt for light and breezy curtains that let in ample amount of natural light and accentuate your interiors with exquisite green decor. As for your home accessories, the world is your oyster – literally! Think oceanic and choose from a wide range of nautical patterns and shell textures that bring out the vibrancy and freshness of the sea. This interior décor style is ideal for globetrotters who do not like to be constrained to one space and are free-spirited – just like the ocean. Personality trait: Artistically unconventional with eccentric taste and quirky style. Let your unconventional way of life resonate with your home décor as you indulge in your love for quirky prints and playful textures! A bohemian spirit will never shy away from earthy tones complemented with a burst of colour. 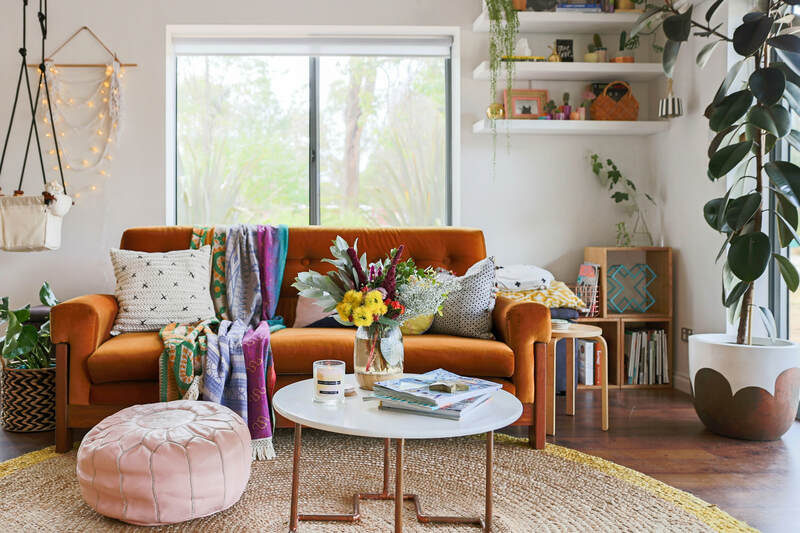 Set your spirit free with rope swings, vibrant cushions, Turkish rugs, vintage headboards, tasselled throws and stunning DIY projects that will keep the compliments coming. Indulge in carefree bohemian décor for a home beaming with life, culture and intriguing items from around the world. The best aspect of this type of décor is that there are no rules – no colour palette to follow or theme to abide by. Go casual chic and create a space which makes you kick off your flip flops and relax. Personality trait: Glamorous and larger-than-life with a liking for the finer things. Extend your modern and upbeat energy to your interiors with an explosion of Hollywood regality in your living room. From lush curtains to ultra-glam upholstery, do not settle for anything less than exorbitant and high-polished. Though opting for Hollywood-inspired home décor brings back popular looks from the iconic ’50s and ’60s, your space can exude top-notch sophistication rather than old-world charm. Think glossy surfaces, clean lines, hints of colour and bold prints, complemented with iconic and bold Greek key patterns. Amp up the drama quotient of your space with this timeless design trend. These top décor tips will transform your home and work hand-in-hand with your key personality traits. Planning to invest in real estate? Head out to Assetz Property Group and get one step closer to your dream home.